Left top, the 1,109 ct Lesedi La Rona minus the portion to produce the first polished stones. In all, Graff expects 60-plus D fl diamonds from the rough. The largest portion of the rough is still under study and the size and shape of the signature diamond remains undetermined. Photo courtesy of Graff. Second only to the 3,106 ct Cullinan, the diamond was found in the Kerowe mine, Botswana, in November 2015 and put up for public auction in 2016, where it failed to achieve its reserve price of about $70 million. Graff purchased the diamond for $53 million in September 2017. Graff’s diamond cutters carefully analyzed the diamond for several months before making the first cut. 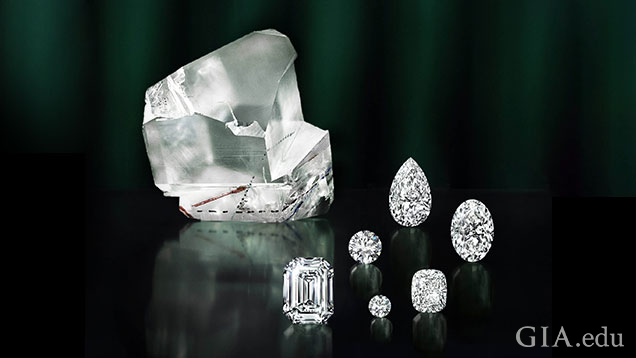 The company did not detail the exact carat weights of the finished diamonds, but the website noted that “Graff designers have envisaged a collection of striking rings, earrings and pendants that celebrate the extraordinary provenance of the Lesedi La Rona diamonds at their heart.” All will be graded and inscribed with the Lesedi La Rona provenance by GIA. The largest portion of the rough is still being worked on, though no estimate of how large or how many more diamonds will be made from the remaining portion have been announced. The 2019 Argyle Pink Diamond Tender saw a 2.28 ct Fancy Vivid purplish red achieve the highest price for any diamond in the 34-year history of the company’s colored diamond auctions. The diamond, named the Argyle Muse, was cut from a 7.39 ct piece of rough. The buyer and the price of the diamond were not disclosed. The other highlight of the tender, a 3.14 Fancy Vivid pink, went to Glajz THG of Singapore for an undisclosed price. All of the 63 diamonds in the tender, which weighed a total of 51 carats, were graded by GIA. The credit squeeze, high operating costs and financial problems caused a significant drop in the number of diamond manufacturing operations worldwide. Ronnie VanderLinden, president of the International Diamond Manufacturers Association, reported at its semi-annual meeting that the decline was “changing the landscape of diamond manufacturing,” according to press reports. VanderLinden said the decline has affected most manufacturing centers, including Africa where many operations that had begun to increase employment and skills in source countries have faltered. Many of these operations were part of large Indian firms that have experienced financial difficulties in recent years because of lagging polished prices and severe credit cutbacks. In China, he noted, diamond manufacturing employment is down to about 5,000 from a high of 40,000. He said the health of the diamond industry depends greatly on the health of diamond manufacturing. A sharp fall in the value of the Indian rupee coupled with on-going credit shortages caused Alrosa, Russia’s diamond mining and sales operation, to sharply cut its sales of small diamonds for its October allocation. Sales that month were $234 million, a 28% decline from the same period last year. The company said its production and total yearly rough sales will be down by about 9% to 37 or 38 million carats. Last year it sold 39.6 million carats. Consumer confidence registered a slight increase in October, despite wild fluctuations in the world stock markets, according to the Conference Board monthly survey.